Vintage flattrack fiberglass motorcycle fuel tank part number VINFTB. Vintage fuel tank part #VINFTB is styled more as a vintage dirttrack tank, but looks great as a Cafe or roadrace tank on smaller bikes. When the original tank came to us it was configured for a pre-OIF Triumph. 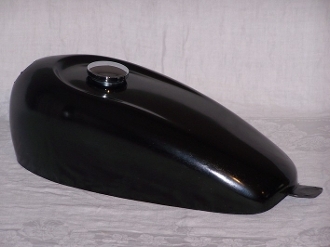 With a selection of tank bottoms available, this tank can be manufactured to fit a variety of bikes. Capacity is 1.75 to 2 gallons depending on the width of the tunnel area required. Base price includes a chrome twist type filler cap. Width of forward area: 10"
Known applications: Triumph OIF and Pre OIF twins. Honda CB160 CB175 CB200. Select Yes please. (+$30.00) No thanks.